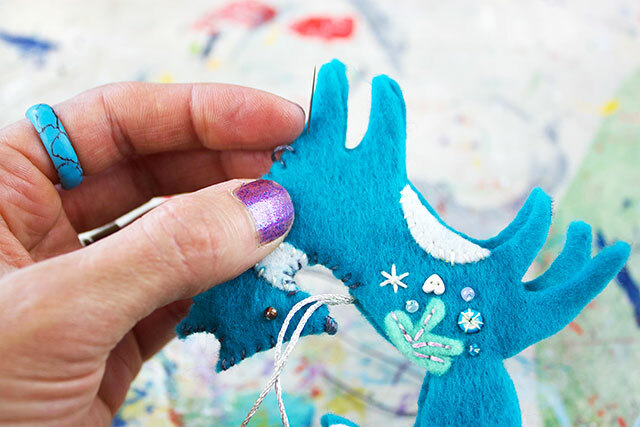 I’m feeling so crafty this festive season! 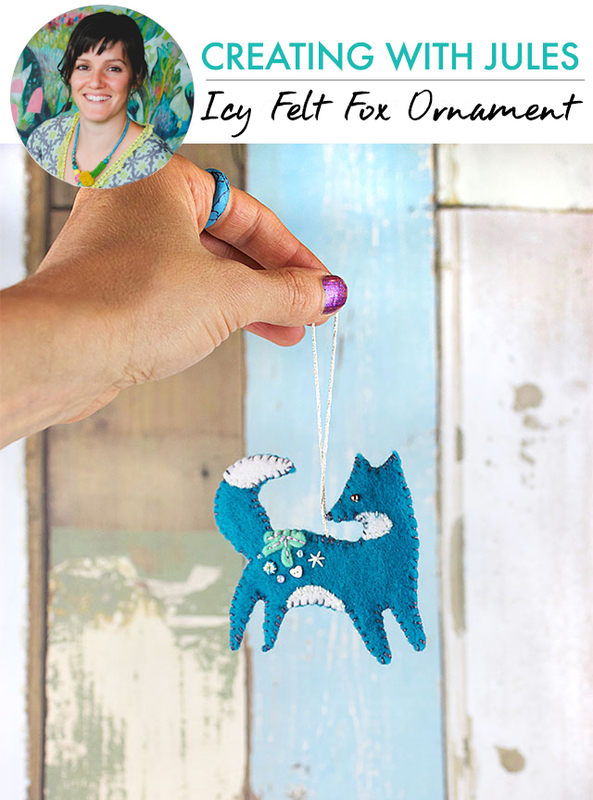 I like to create decorations that are more modern using non traditional colors, but you could make this fox ornament in any colours you like! Download your template HERE print your template at 100% and cut out. Now trace onto the blue felt twice and cut out. (I find it’s helpful to trace onto the felt using a pen on the wrong side of the felt pieces.) 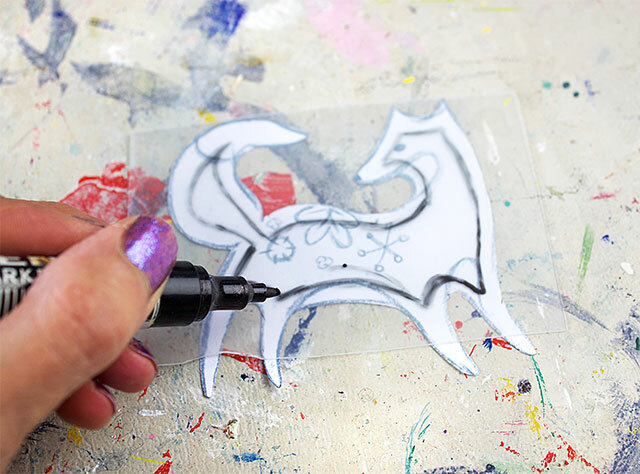 Cut the smaller pieces out from the paper template to use as little templates to trace around and cut out your white pieces of felt. 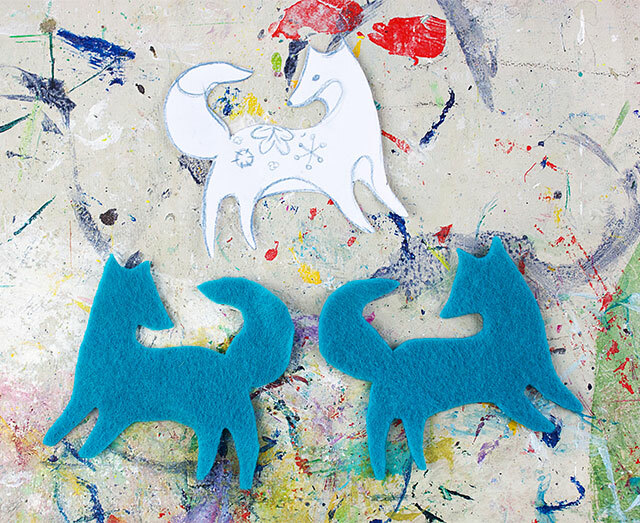 Sew the white pieces of felt onto the right side of one of the blue pieces of felt using whip stitch. 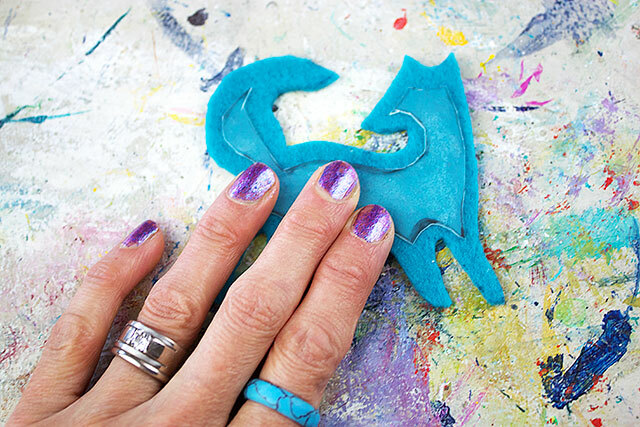 My tip: stick them on with a light application from a glue stick first to hold them in place before sewing. 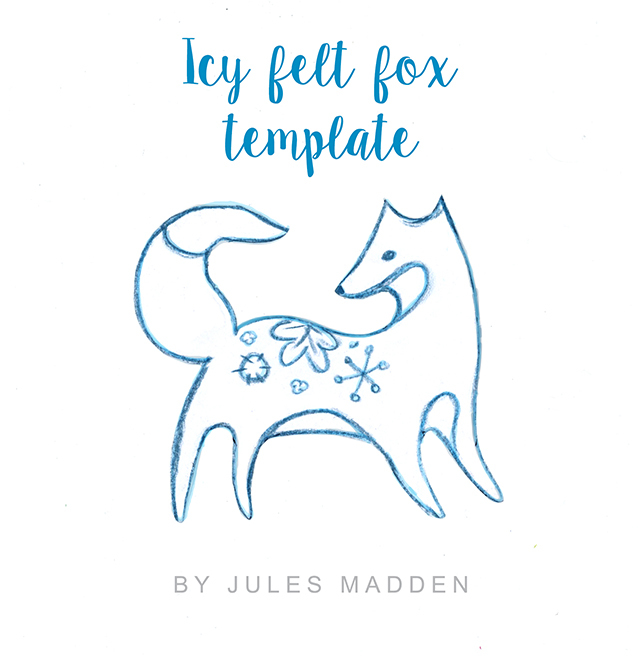 Then sew some decorations onto the fox using the template and photos as your guide. Use what you have on hand and see what you can come up with! 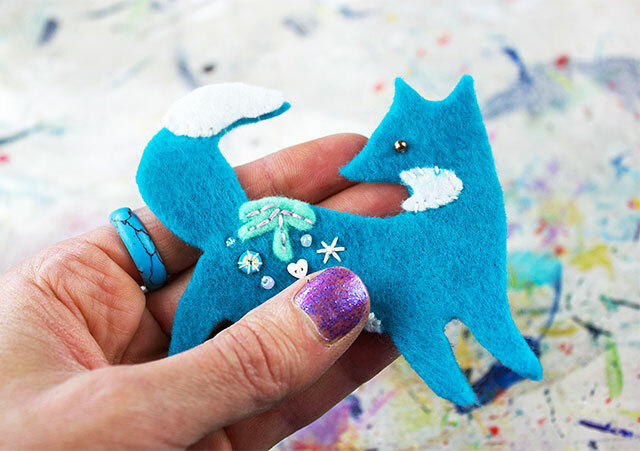 Sew a small bead onto your fox for an eye. Using the glue stick again, attach the plastic/ cardboard between the two body pieces of felt and whip stitch around the edges. 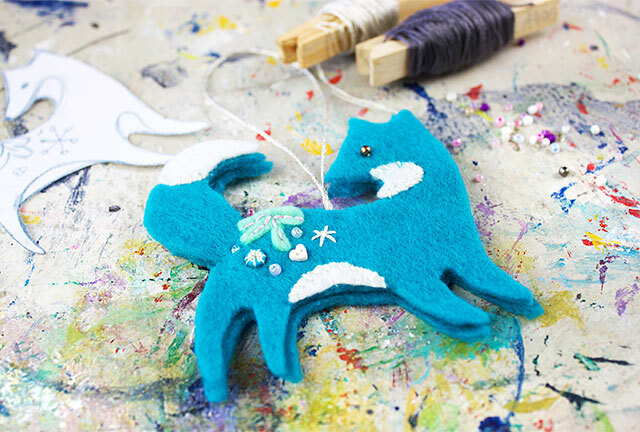 Before you sew up foxy’s back, tie a piece of the silver thread and sew it in just next to foxy’s nose like in the photo, then your fox should hang straight. Use a needle to pin in place first to see if you have your silver thread in the right place. Finish sewing all around, tie off and hide thread end inside the fox, and you’re done! 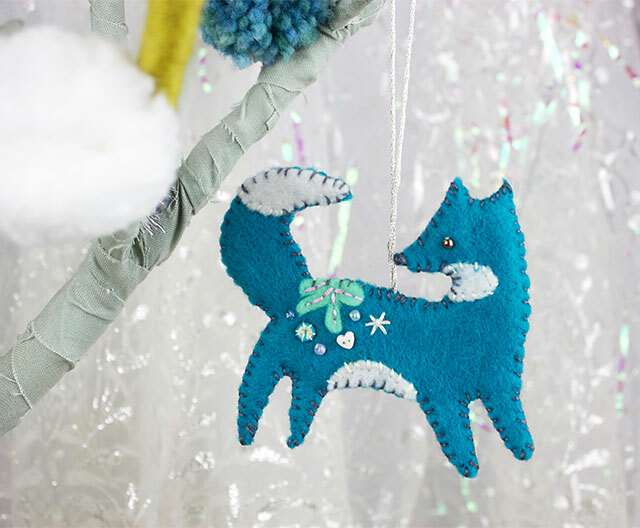 Time to sit back with a cuppa and look at your handmade creation on your pretty Christmas tree! I hate taking down my Christmas decorations - not because it's hard but because it looks so dull inside after all the exciting decor. Several years ago, I began decorating for January - snowmen, white twinkle lights, cute felt pillows, etc. Your ornament started as one to add to my grandson's nature Christmas tree. 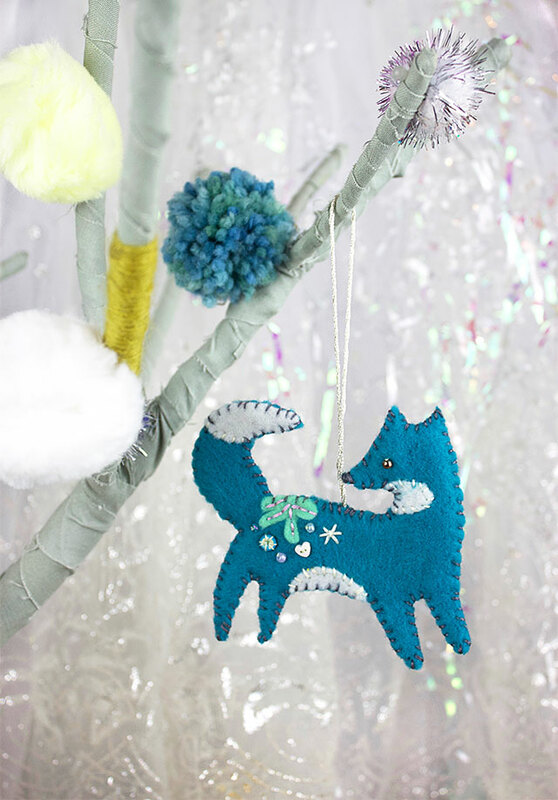 After seeing the painted branches that had pom poms hung/ glued on, the cute fox has been added to my decorations for January. My grandson and I will collect branches and paint them (he is 3 yo) but how can he mess up white paint on a branch - perfect for him. This will be our little tradition each year and he can help make ornaments to hang on it. THANK YOU for this fantastic way to enjoy time with my grandson and decorations that should last a long, long time. last 24hr flash sale! the business bundle! 24 hour flash sale! art journal bundle! 24 hour flash sale! floral bundle! 24 hour flash sale! painting bundle! new online classes are here!